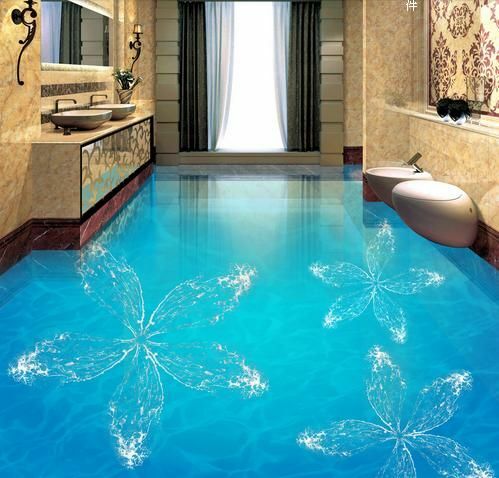 Home » 3D Flooring » Bathroom » Epoxy » Flooring » How to get 3D epoxy flooring in your bathroom in detail? Bathrooms are one of the most usable and changeable corners of the house due to their nature as they are exposed to moisture and water constantly, so bathrooms have a unique challenge among all the spaces in your house. Today we will mention how to give vitality to your own bathroom and toilet by using some designs which are suitable for the bathrooms, whether in the floors, walls or ceilings to get an amazing bathroom without any problem. If you are planning to change the bathroom floors and walls, there are many types of bathroom designs you can use such as tiles, ceramics, and porcelain as these are the most popular types in the market, but their disadvantages appear over time, and the choice of colors and designs is limited which leads you to change the bathroom again, so you need to change your old bathroom design by using a fabulous design and find the best solutions to get a stunning bathroom. What is the best solution to get a unique 3D bathroom flooring? 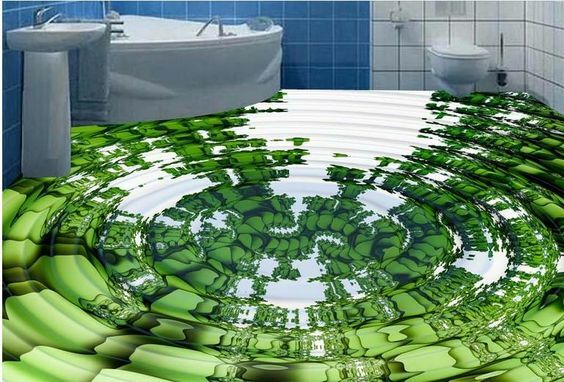 One of the most prominent techniques to find an attractive way to enhance the decoration of the bathroom is the Epoxy Coating Technology which is designed for conditions of the surface and tough environments. 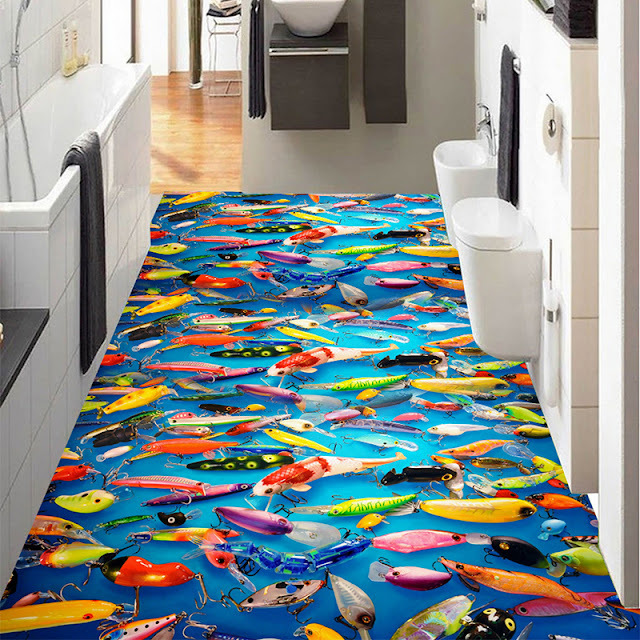 It is the most advanced technique in floor covering industry as it also gives you another feature which is 3D Epoxy Flooring and murals being designed in the best way to suit the bathroom as it has many advantages to be installed in various shapes and designs to transform the bathroom into a place which would be in your imagination. By the 3D technology, designers today all over the world are combining the advantages of elegance, style and aesthetic designs that can be incorporated in the decoration of distinctive places easily as it contains all forms of decorative art. Why do you choose the 3D Epoxy floors for the bathroom? Why are the 3D floors most suited to small bathroom? 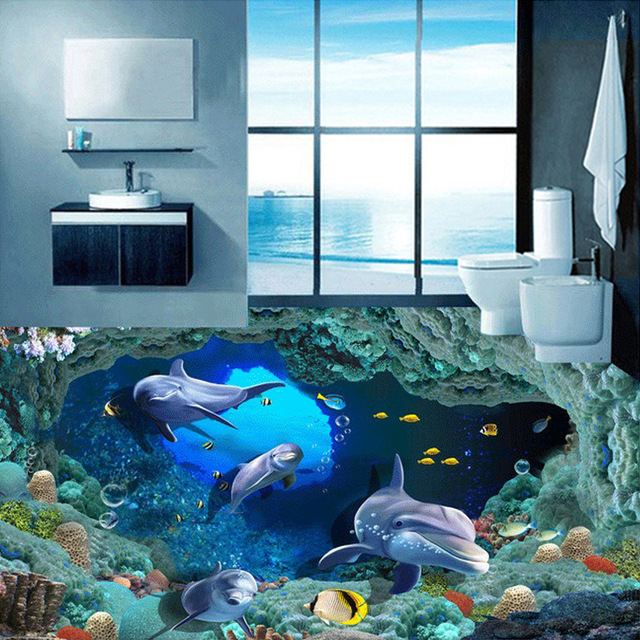 How to install 3D bathroom murals? What are the best tips for taking care and cleaning of 3D Epoxy bathrooms? How to use the 3D Art in the interior Decoration 2019? How much does it cost and how to buy 3d bathroom flooring? 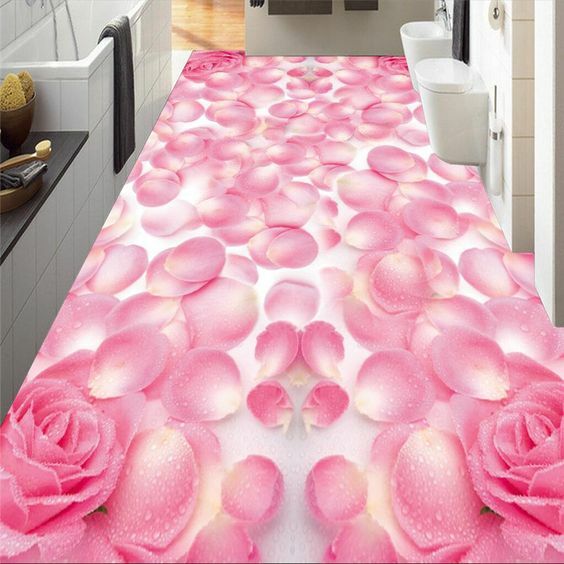 Be one of our followers to receive the latest trends and tips on how to design unique bathroom floor in your interior? Why do you choose the epoxy painted 3D bathroom floors? At the present time trends in decoration lean towards the boldest colors and modern designs, the 3D Epoxy Flooring demonstrates a unique option that would work well in the bathroom flooring design, so the 3D Epoxy flooring has become the demand of many customers at the present time and it is one of the most prominent options that provide modern technology to customers in the floor covering, which is advised by the best designers in modern home decoration. As well, the 3D flooring has gained a lot of confidence among those who use it at home and in different locations due to its high quality and features that overcame all the disadvantages of previous types of floor covering technology known to all. What are the advantages of 3D Epoxy Flooring? 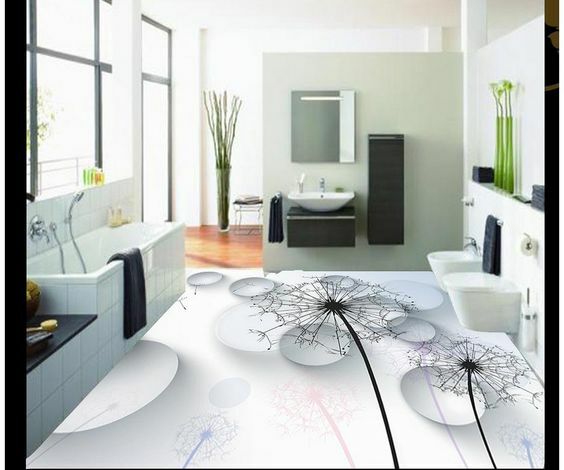 With 3D Epoxy, you will get a forever modernistic bathroom design. To get visual effects, brighter look and 3D images color that never fades which makes the bathroom look charming, then you have to go to the best choice with a 3D Epoxy coating. The Epoxy floor is extremely durable and almost completely stain-proof one. It is water-proof so it can absorb water when it's wet. Resistance to moisture, non-slip and easy to clean. With 3D Epoxy, you will get a floor without breaks and be one piece. Transparent material glossy and shiny. Freedom of choice in any style, colors or design of the flooring and walling. Scratch-resistant and making the floor very soft. It has the charm that easily impresses everyone. Epoxy floors are the best hygienic method for floor covering and you are guaranteed of an ever clean floor because it doesn't attract dust, doesn’t attract allergens that may infect allergically, this makes your bathroom suitable for small kids to enjoy. This ensures 100 % hygiene. 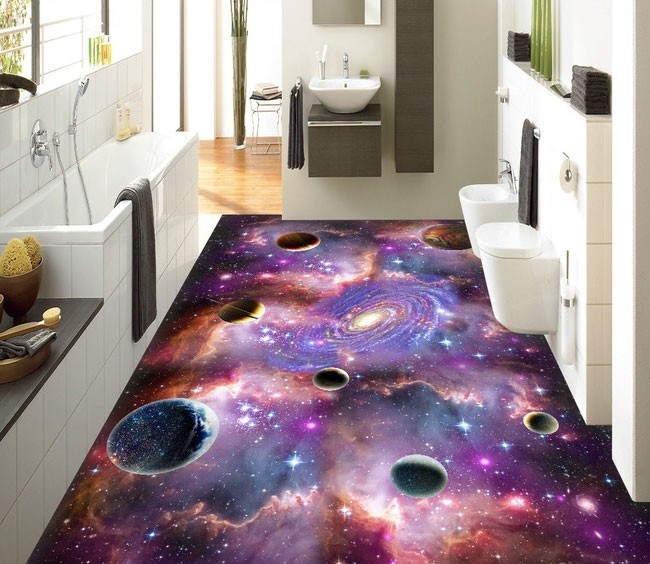 How to design an amazing 3D floor in bathrooms? 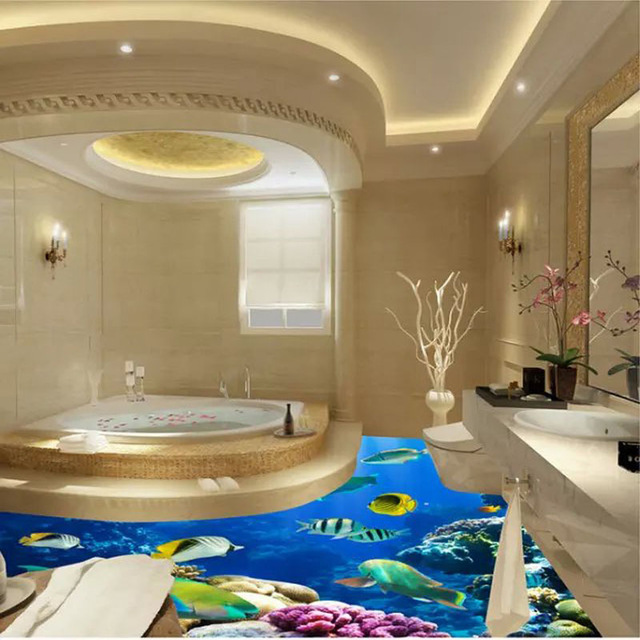 To make a beautiful bunch of design ideas for 3d bathroom flooring and murals, the application of 3D Epoxy gives you a full support and endless options of design varieties, textures, and patterns to achieve your imaginative bathroom design ideas. 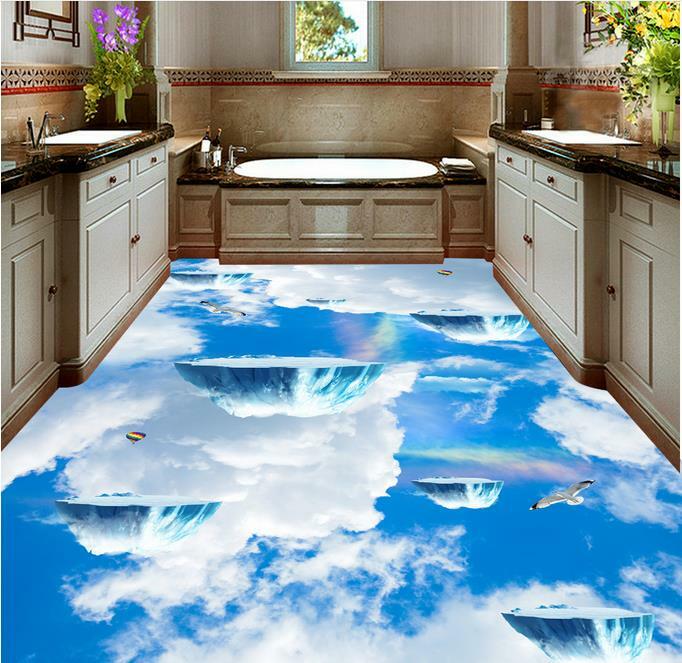 Turn your old bathroom design into a fabulous one by using the 3D Epoxy flooring which gives your bathroom floors durability, longevity, strength, color, brightness, and a more stunning view. If you are looking forward to having the best way to get a modernistic bathroom design forever getting a brighter look for your bathroom floors and walls, it will be achieved by using 3D Epoxy. Why are the 3D floors most suited to a small bathroom? The small bathroom creates some design challenges which drive you to renew your bathroom design and add some modern designs to make a big difference in your bathroom's appearance by using 3D Epoxy coating technology as it overcame many design problems in the small places because shapes and styles of 3D murals make your bathroom appear to be wider and gives you full support and endless options of design to blend with your imagination. Some of the benefits that have made epoxy become a trendy type of small bathrooms are that it has a beautiful bunch of design ideas and comes with several color choices and the look that you love. You have the best choice with 3D floors to enhance the space and beauty of your bathroom. The 3D Epoxy flooring is a fantastic replacement for traditional tiles. Over the years tiles can chip, crack or the grout can wear away but the 3D Epoxy floor is durable, so don’t worry about the aesthetic problems such as many another flooring. Epoxy thin sets offer greater bond strength and chemical resistance than tiles and other covering floor materials, which makes it the first choice for the design and finishing bathroom. 3D flooring has an option of colors and styles more than 3D floor tiles. It is easy to design a pattern or picture that you need against the tiles that need to be designed in factories. The 3D Epoxy also gives your flooring a great and an attractive look. 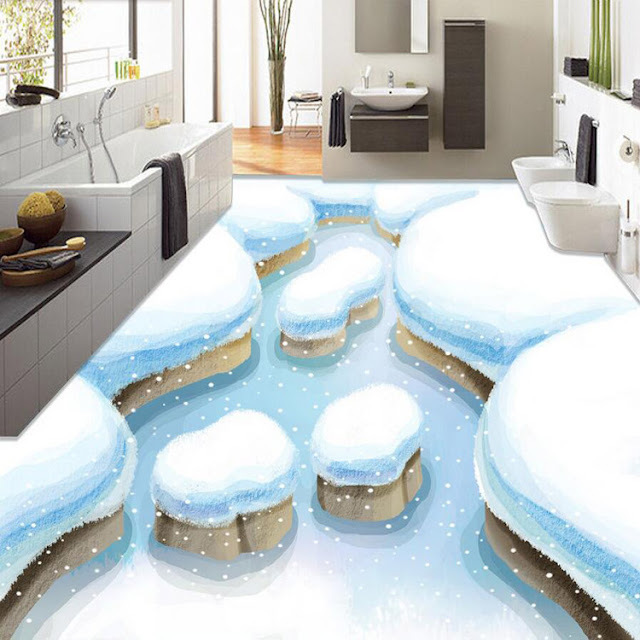 Reducing maintenance and cleaning of your bathroom by the installation of 3D epoxy flooring bathroom due to its epoxy quality gloss so that it does not attract dust against the tiles being difficult to be cleaned easily. 3D Epoxy is a hygienic floor and environmentally friendly against tiles and other covering floors as they can attract microbes through cracks that can cause diseases. How to install 3D epoxy flooring with murals? We have latest ideas and designs of 3D bathroom flooring and 3D murals allowing you to choose and install the style and design that suits your own bathroom. You should follow these tips before installation• You must know your own design specifications before installation in terms of surface preparation and treatment in terms of cracks and meandering. • Select the flooring system, the product, and a proper installation system. • Choose the suitable coating for the material which uses in a 3D floor covering design for the bathroom. Apply the base coat for your bathroom floor. The epoxy must be mechanically mixed an electrically drilled. Make sure your surface is totally clean, solid and free of all dust and debris. Use an abrasion-resistant coating layer. Pour out the epoxy on a floor in a fairly long trail ribbon and spread it around the required areas and in the way you like. Make two layers under the 3D floor murals, each layer takes around 4 hours to dry. Select 3d floor mural image according to the design of flooring you want, whether a photo or a painting which makes a 3D effect with a high-resolution 3D picture. Use the roller to remove air bubbles to install the image on the floor properly. If you follow these instructions you will get a transparent and a beautiful image. For more details about 3D Epoxy Installation, move to the main article from here (ultimate guide to 3D epoxy flooring). 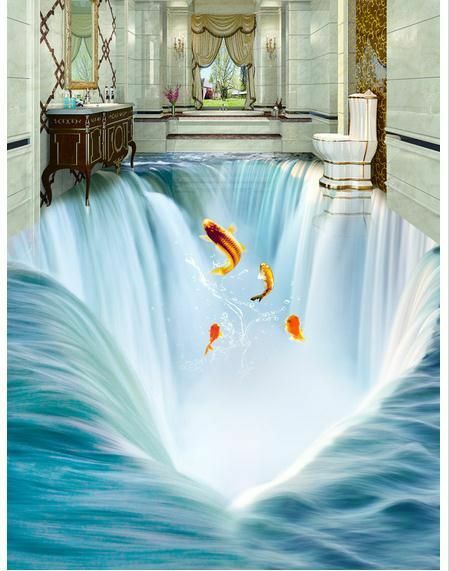 The 3D murals are used to give a natural feel to any place and 3D epoxy floors and murals let you experience the thrill of going to the toilet. 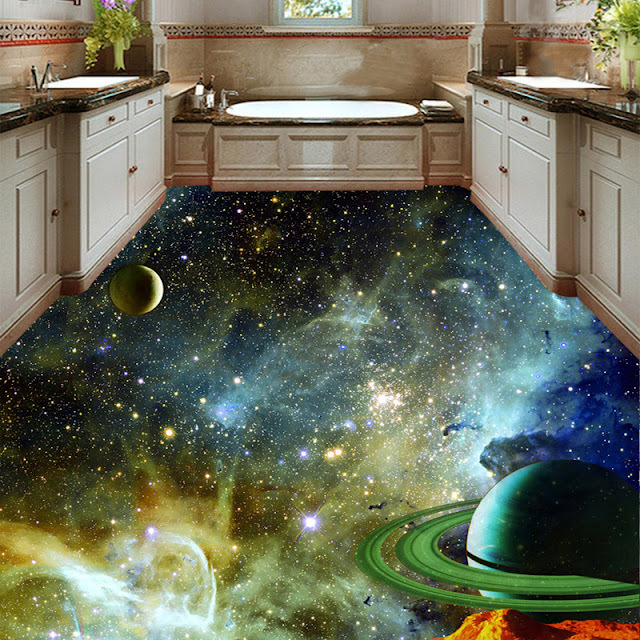 With 3D flooring murals, you have methods of creating a true masterpiece from the designs and works of art which let you turn your bathroom into all designs of your imagination. 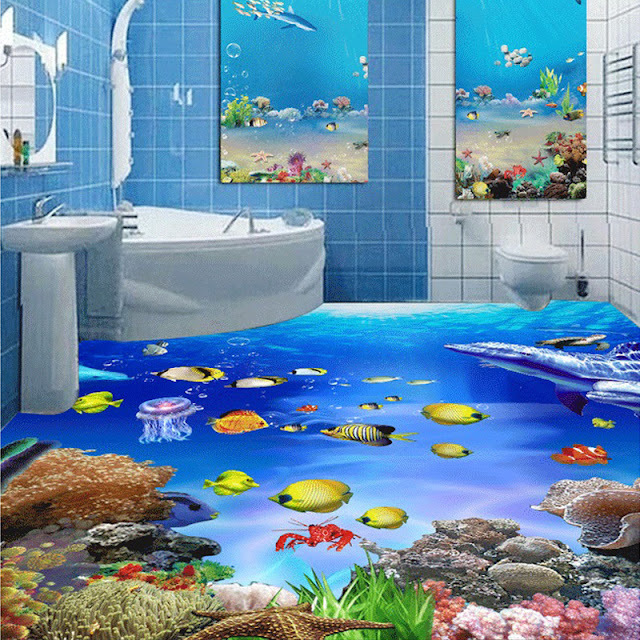 As well, you can lay all kinds of flooring murals in your bathroom which can dazzle the eye and excite the spirit as you can design the 3D epoxy to fit the look of your entire home especially bathrooms such as these ideas (an ocean, seashells, colored sand, fish and other small items which make you live on the deck of a glass-bottom ship (glass boat). 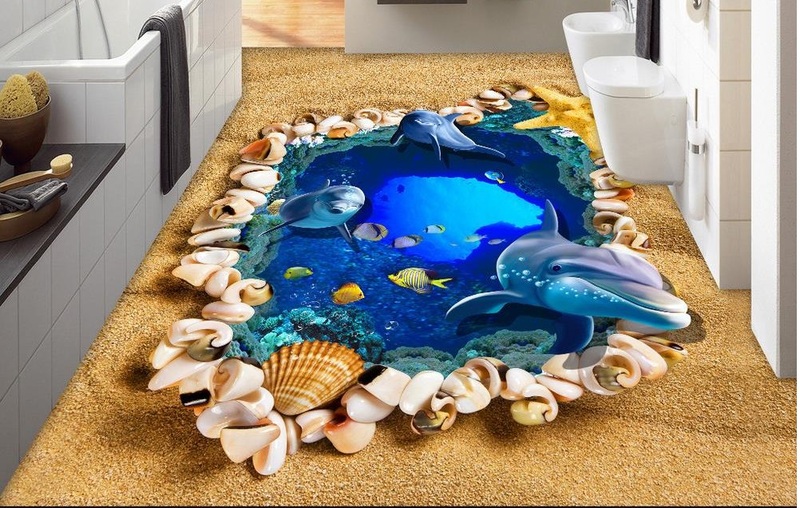 Imagine that you feel like you swim with dolphins every time you enter a bathroom with this technology of 3D epoxy flooring that makes the picture is so real which makes you feel that the dream became true and it's a part of the scene. Imagine walking into a room and being instantly transported to an ocean floor with strewn seashells which create warmth and feeling quiet in your bathroom. 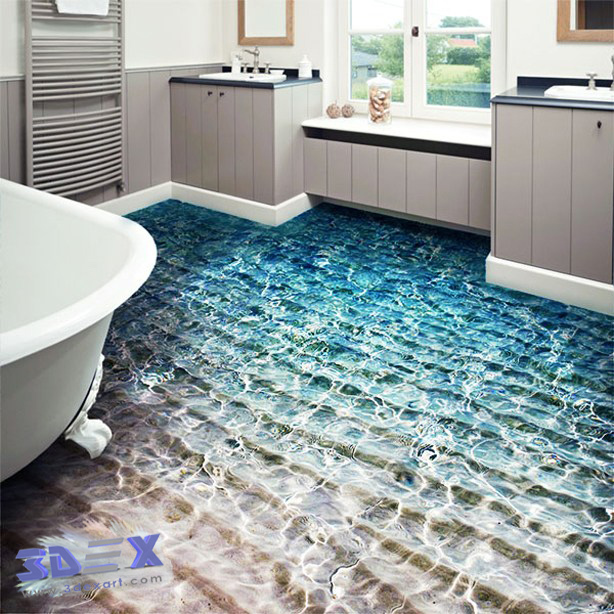 This type of 3D effect that makes it appear like a real ocean with the waves that seem to move under the surface which causes you enjoy spectacular views and breathtaking underwater in your bathroom. 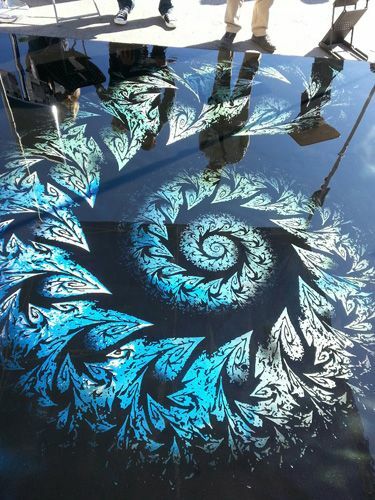 The oceanic murals effect is considered as one of the most popular effects in regards of the flooring. Everyone wishes to live in a place like a paradise, a place that makes you feel like you are on vacation all the time as you can add a touch of a natural environment when you design your bathroom with these flooring murals stones. These designs are fantastic, unique and look like real rocks which let your bath time be amazing and make you enjoy a feeling of splendid times. With 3D flooring stones, the magical and amazing places are now under your feet that are only limited by your imagination. The stone murals effect is considered as one of the most popular effects in regards of flooring. Imagine that you are in a trip every time you enter your bathroom with a 3D epoxy floor which can create fascinating lively impressions of nature in your home, Magical marine life, loving dolphins. 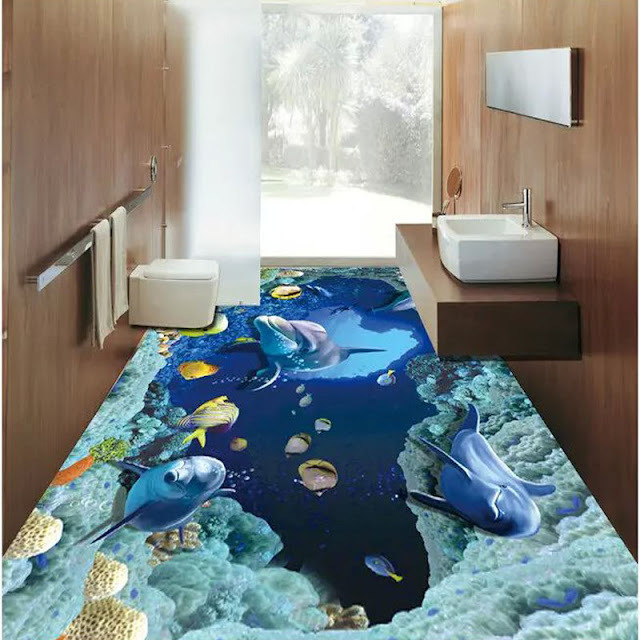 These flooring murals will enrich your home every day with an innovative and artistic way allowing your imagination to feel you are like diving or snorkeling in a seabed with colorful coral reefs and fish which can be inspired and seem to move at all the bathroom. The 3D flooring murals offer pretty convincing color effects as these 3D epoxy floors would be suitable for those who love bright colors. 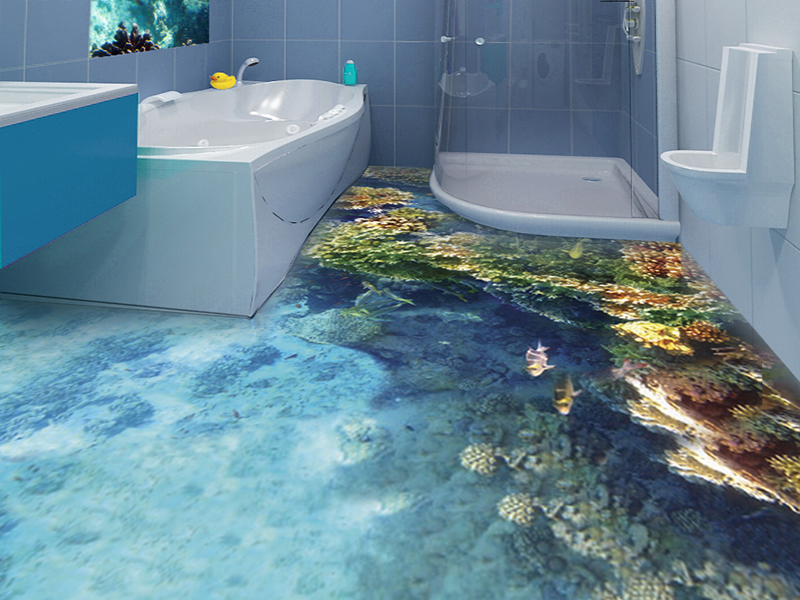 Take a look at some of 3D flooring coral reefs, colored fishes and undersea world below. The creative ways for bathrooms can become a dream project through the 3D flooring design and the bathroom renovation is a great challenge for designers, so designers and artists compete among themselves to design the best 3D murals patterns which found in different styles and colors that give you more opportunities to choose from hundreds or even thousands of 3D flooring murals which could be distinctive and exciting for using on the bathroom floor or suitable for every room at home. 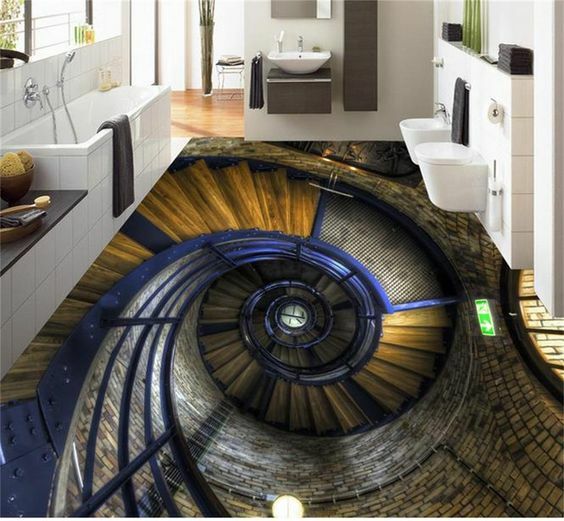 You can get aesthetics, luxury, and durability in your bathroom through these creative 3D murals ideas and through the settings of 3D epoxy flooring. How to use 3D Technology to decorate the bathroom? Everyone around you has ideas but what matters more is the vision and the dream you have to change the design of your own place. Achieving this perfect appearance depends on a wide variety of colors and decoration that found in the latest techniques in the home decoration through 3D epoxy that can be implemented in every place in the bathroom such as floors, walls, ceilings, furniture and accessories which can transform your bathroom into a vivacious and a beautiful place and charming to everyone with a unique and timeless look. The proper care and maintenance procedures for your particular flooring system are very crucial. Why should not you overlook proper maintenance of your floors? Appearance: Your floors impact your environment especially the commercial and retail locations for keeping firm logos coatings and finishes, so the appearance of your floor is very important. Safety: It is a very important factor in any commercial or industrial floors to be achieved in slip-resistant, waterproof or offer static control. Sweep your floors daily: With using a soft-bristled broom or mechanized sweeper, daily sweeping helps extend the life of your floor. Wash your floors weekly: Mopping your floors will keep your floors high performing and look bright and shiny. Treat stains appropriately: If your flooring appears to be stained please act sooner, rather than later. Keep sharp objects away: Avoid dragging, sliding, potentially sharp. Avoid heavy equipment across your floors to prevent cutting. With the installation of epoxy flooring at the bathroom, you do not need to bother yourself in the cleaning and maintenance due to its epoxy quality gloss, hardness and resistance to moisture and easy to clean. These simple tips will help you to care and to clean your floor system and help to extend the life of your floor. With the installation of epoxy flooring bathroom you do not need to bother yourself in the cleaning and maintenance due to its epoxy quality gloss, hardness and resistance to moisture and easy to clean. 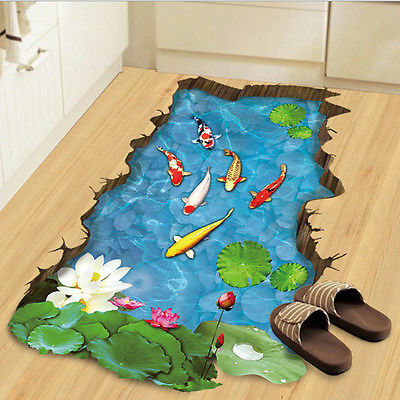 The type and design of 3D floor or decorative floor. Price per square meter is linked to area and workplace. The high prices range start form $ 100 up to $ 500 per 1 m2. This cost includes materials, used pattern, 3D image, cost of paint, base preparation and installation work. 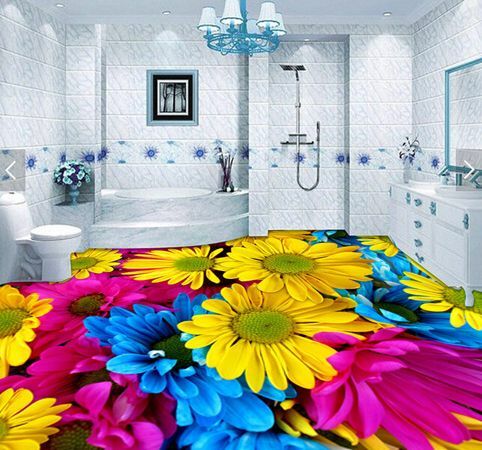 You can buy all the raw materials you need from online stores, in the implementation of 3D bathroom flooring. Because your convenience is important to us, and to make it easier for you, we have assembled the best collection of materials and tools that will help you to apply the 3D bathroom flooring.